In this post, I will not be addressing what is and isn’t an archive (Joe’s throwing down on that), but for full disclosure, I will be using the terms “archives” and “digital collections” interchangeably when referring to a grouping of materials. 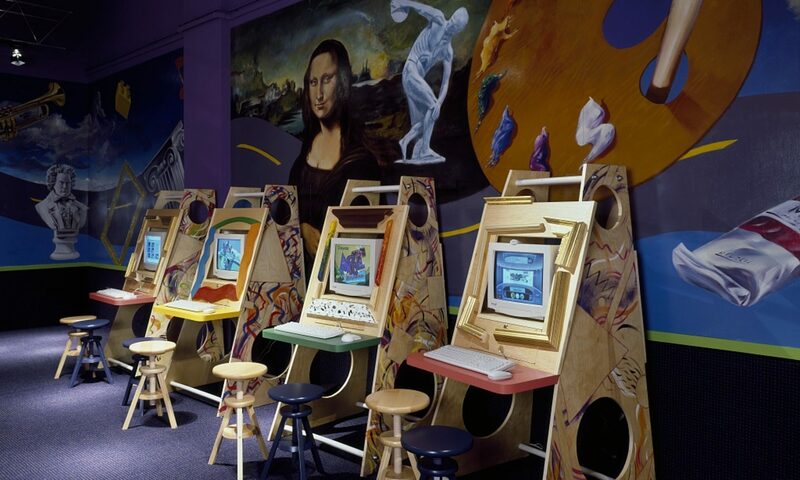 What I will do in this post is compare features of digital archives highlighted in the readings, and discuss how they are affecting the context of digital collections in new and awesome (?) ways. McGann is right to say that hypertext is redefining how users interact with archives in the digital environment. 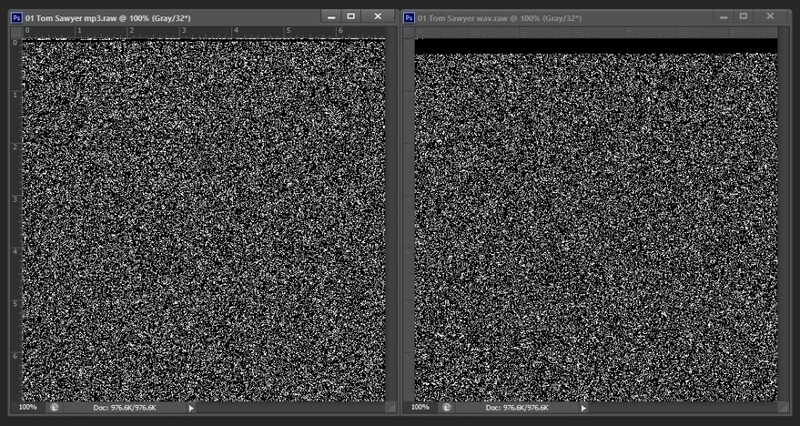 Instead of needing books to analyze books, digital material (born-digital and surrogates) allows the “white sea of paper” to recede. 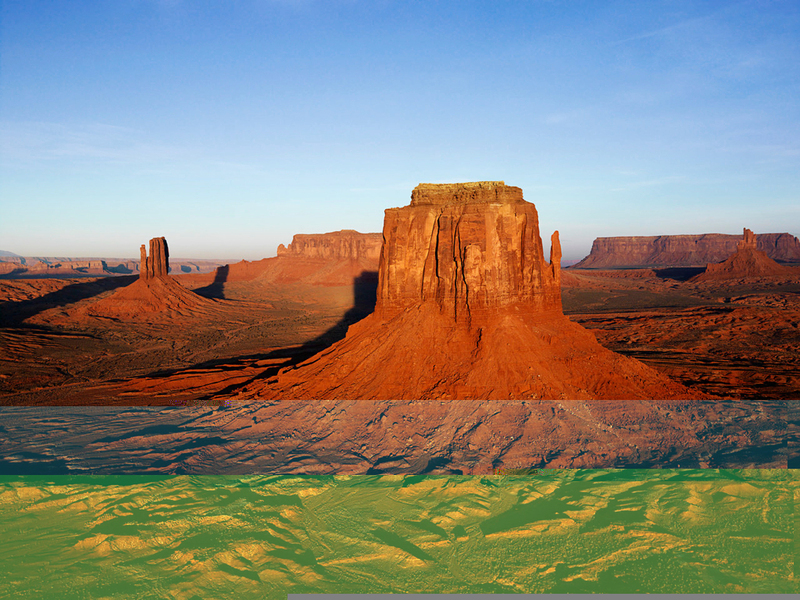 Researchers are no longer limited by geography or representation when deciding what objects they’d ideally put in dialogue with each other . Hypertext has the ability to aggregate dynamic objects together to inform or comprise a collection, and although Theimer implies that this violates the context of these collections, McCann argues that hypertext allows us to create richer context for our collections that was never before possible through this digital tool. Of course, hypertext is so easy that it allows anyone to be able to create a collection, not just the “professionals” that respect archival theory, have an HVAC compliant preservation environment, or the budget or reputation to acquire material, and so this loss of control may be seen as threatening (a familiar theme for this class, I know). 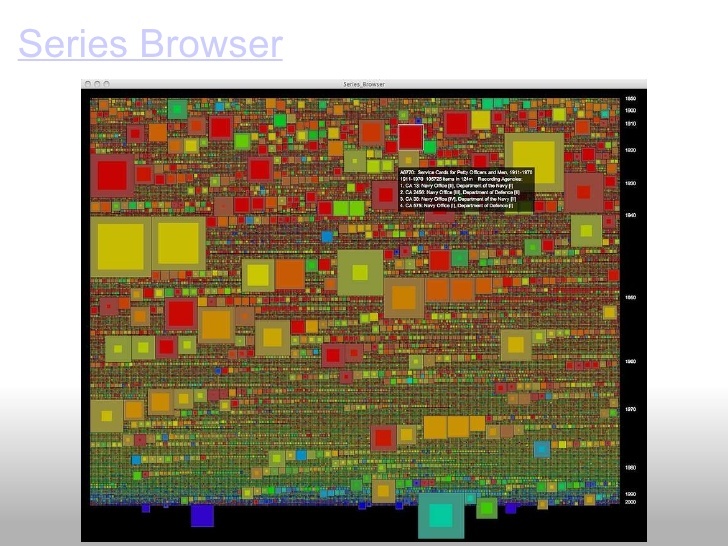 In his article “Disrespect de Fonds,” Jefferson Bailey introduces us to the Series Browser Visualization tool from the Visual Archives Project. With this tool, the context and codex-like purposes of a finding aid are replaced by networks and inter-linkages that communicate the relationships and size of hundreds of record groups, all visible to the user on a single screen. As Phillips points out in her article, this capability creates some questions. If we can make this scope accessible for researchers, should we just take everything? Will changing what users can get affect what they actually want? Although Phillips is specifically discussing appraisal, we can see it as a context issue as well. Selection of what to keep is the act of an archivist indirectly creating a context for the user; the responsibility of deciding if something is trash or treasure is, in my opinion, one of the most stressful aspects of the job. Through visualization tools, appraisal could potentially become a thing of the past; a hindrance to context that was a product of its time, much like Bailey argues fonds was a product of its time that has also become obsolete in the digital age. 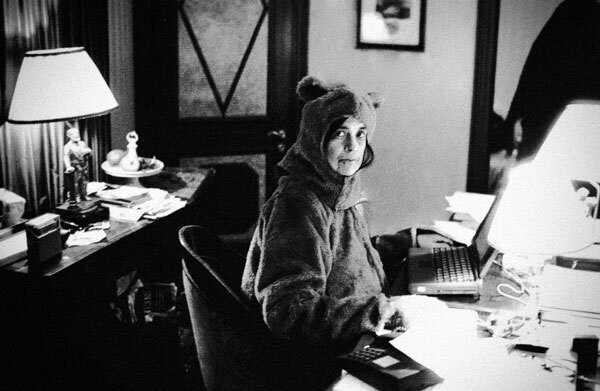 When we search, we may feel as if we can finally, totally, and quickly find everything we want to know about a particular aspect of Sontag’s work or life, but the very ease of that process makes our misguidedness plain. What we are “finding” is, of course, nothing more or less than particular words in a particular order. Having the writer’s laptop in your hands makes you think that you have it all, but as we know, even something as ubiquitous now as text searching leaves out semantics that a computer command just can’t register at our current technological capability. Even though there are still many challenges, looking at these features makes me incredibly excited about the potential for digital collections to tell richer stories when freed from aspects of appraisal and geographical limits, for finding aids to be reimagined as visual maps vs. textual ones, and for true original order to be captured at the bit level. But if i’m honest, it’s a little scary too. What if we’re eschewing things we shouldn’t be? Bailey’s article consoled me that there was never a “true” way to process things, just a way convenient for its time. But does anyone else have a nagging, apocalyptic side that sees the bubble bursting after we burned the book that got us here? Maybe this Sagan quote will warm you. In Mechanisms, Kirschenbaum hopes to present “a set of alternative access points for the study of computing, access points that bring storage, inscription, and engineering into the visible purview of what we think of as new media” (p. 35). 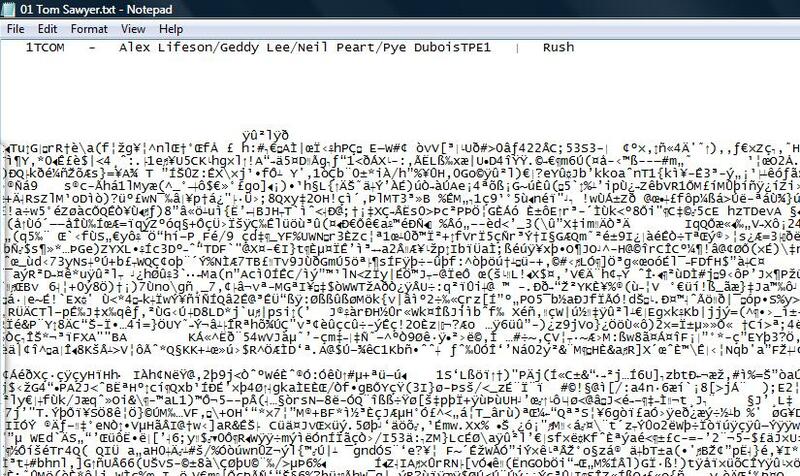 By examining the textuality and materiality of electronic records, the “thingness” that makes a collection of pieces – hardware, code, programs, bits, etc. – into a whole digital object that we can experience, he seeks to demonstrate that these forms of new media are more than what we can see at a superficial level. To truly understand digital objects, Kirschenbaum asserts that we much look beyond our tendency toward “screen essentialism” and examine what is happening on the other side of the screen. Kirschenbaum breaks the concept of materiality into two areas, forensic and formal materiality. For these definitions, I like (i.e. 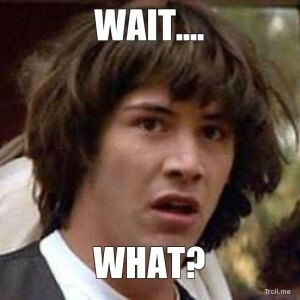 I can understand) the explanation given by Viola Lasmana in her review of Mechanisms. According to Lasmana, “formal materiality involves the use of software to make up the simulated materiality that we see on the screen. Forensic materiality, on the other hand, is the inscriptive, the trace, the ‘difference’ that is based in individuality.” In chapter 3 Kirschenbaum links the concepts of formal and forensic materiality to allographic and autographic objects respectively. According to Kirschenbaum’s explanation, “allographic objects, such as written texts, fulfill their ontology in reproduction, while autographic objects, such as a painting, betray their ontology in reproduction” (p. 133). This is how I understand these concepts and categories. With respect to texts, or much of what we would consider secondary sources, the carrier of information contributes little to most peoples’ understanding of the object. Public library users, for instance, frequently care little if they are looking for the latest John Grisham, whether the book is hard or soft cover, or even large print. The content of the work remains constant regardless of format. In electronic media, and other objects with artifactual value, the carrier or the format has much greater importance. A copy of a daguerreotype will relate the information contained within the photo (a boy with his dog, material culture, the built environment) but the original photograph has added artifactual value simply because it is a daguerreotype. According to Kirschenbaum, to truly understand and therefore preserve a digital artifact you need to understand how it was created, how it is being stored and how it is presented. You need to consider the digital artifact beyond what is seen. In addition to that those featured dates, I will also create a page of “Annotated Enumerations” that will cite significant numbers associated with the war (e.g. numbers of dead, numbers of resulting Constitutional Amendments, number of total battles, numbers of people emancipated, numbers of books written about Lincoln and/or the Civil War, weather stats for DC, interesting parallels in dates/time, etc.) So, I’m looking at 5 to 6 blog entries over the course of the month, some of which will have a brief podcast associated with it–if not all, I am still assessing pricing and practicality. New York Times, Disunion Blog: Disunion revisits and reconsiders America’s most perilous period — using contemporary accounts, diaries, images and historical assessments to follow the Civil War as it unfolded. 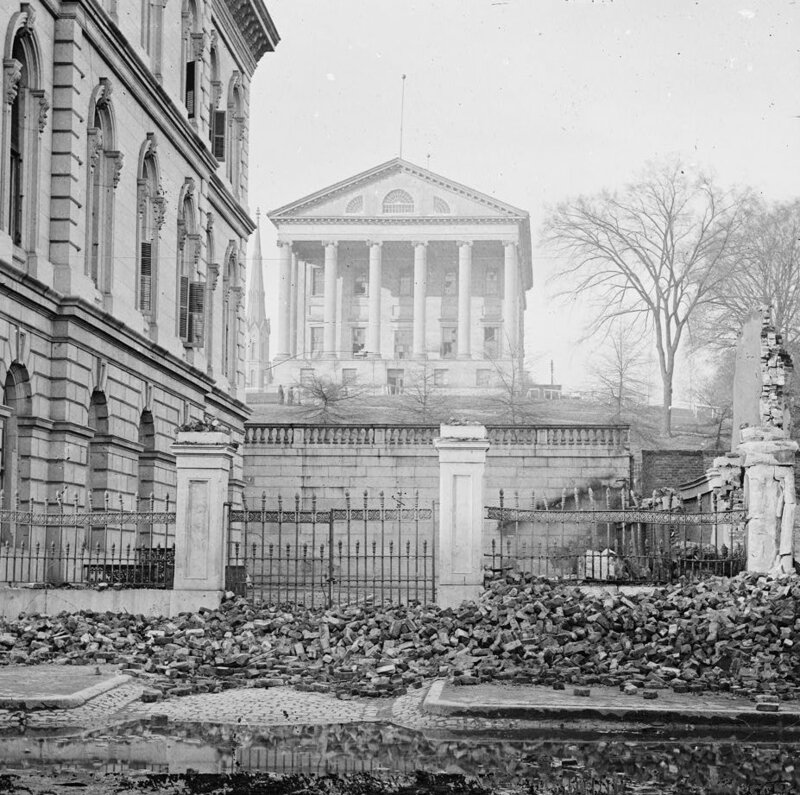 Some are maintained by amateur historians, like The Civil War (1861-1865): A History Podcast. Kinda dry but very chronologically extensive. William O. Lee Jr. (1928-2004) was a prominent Frederick County citizen, active in local education, politics, civic associations and his church. 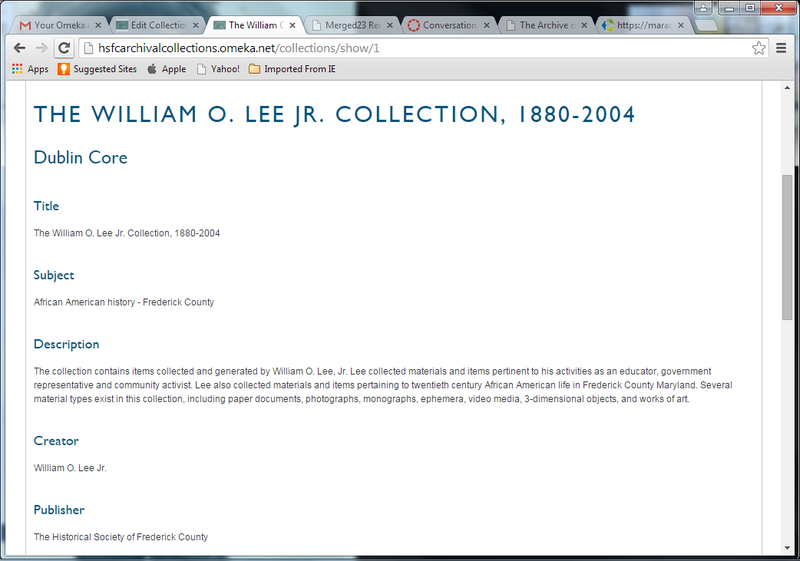 After his death in 2004, Lee’s papers were given to the Historical Society of Frederick County (HSFC). The materials within the William O. Lee Jr. Collection are those gathered or created by Lee through the course of his life and include photographs, documents, ephemera and memorabilia, video, and three dimensional objects. The collection documents Lee’s personal, professional and political life, late 19th and 20th century African American life in Frederick County and Frederick County history. 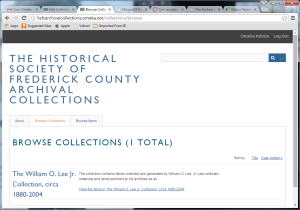 For my digital project, I will create a website for the archival collections of the HSFC and a collection guide for the William O. Lee Jr. Collection, collection MS0080 of the Historical Society of Frederick County’s Archives and Research Center. 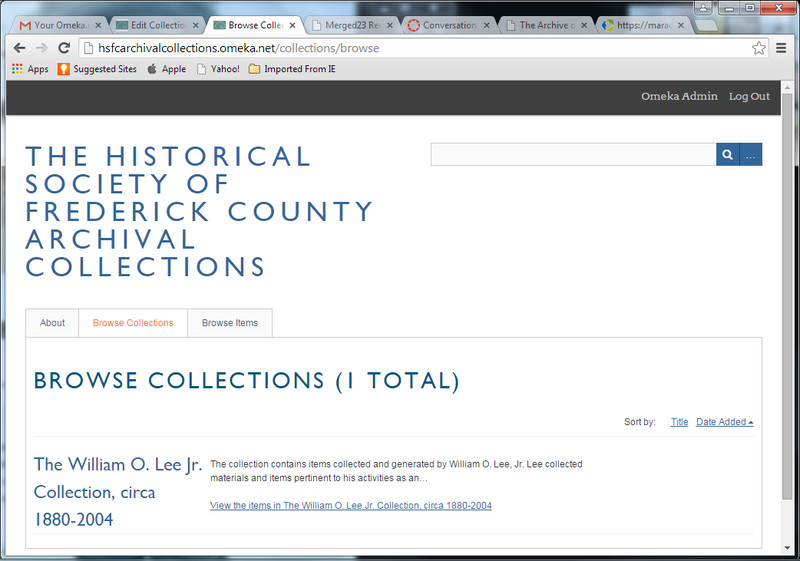 Using Omeka I will display the collection’s finding aid and exhibit collection items. 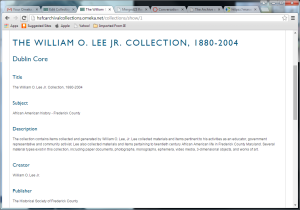 The Lee Collection is the only collection belonging to the HSFC which documents the lives of African Americans; a wonderful collection that gets very little use. Creating an online guide for the collection would increase user access to the collection and hopefully result in greater interest in the Historical Society’s Archives and Research Center. At the Fall 2014 meeting of the Mid-Atlantic Regional Archives Conference (MARAC) I attended a half-day workshop on building a “catablog,” or an online site designed to share finding aids using blog technology (see p. 8 of the MARAC Baltimore Program for a description of the workshop). The instructor was Lindsey Turley of the Museum of the City of New York. During the workshop we used WordPress to build practice online catalogs, posting finding aid content and photographs. WordPress provides small institutions like historical societies with limited resources, easy and affordable ways to host online finding aids. Omeka, as a platform designed to display collections and build online exhibits, provides similar opportunities for small institutions.